Ever heard of this 瑞士雞翼, that literally means “Swiss Wings”? Well, it’s neither originated in Swiss nor has anything related to Swiss at all. Actually, they are cooked in sweet soy sauce with herbs. Most of my friends in Hong Kong love chicken wings. So does my daughter. She can have wings for snack, lunch or dinner. Whenever chicken wings are cooked, they won’t stay too long on table. 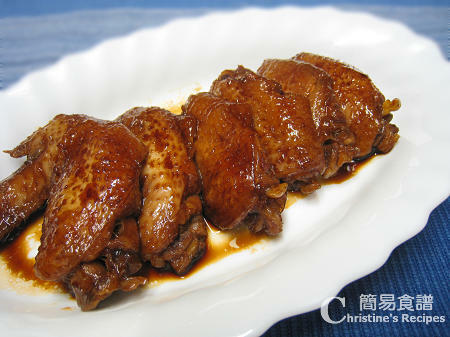 I really love this quick and simple recipe of cooking delicious chicken wings for her. There was a funny story spread around according to Chinese wikiipedia. The recipe of Swiss Wings was invented by a man, named 徐老高 (Xu Lao Gao) who owned Tai Ping Koon Restaurant in Hong Kong that was inaugurated in 1860. That said, a foreign visitor asked one of their waiters what the name of the recipe was. The waiter answered, “Sweet Wings”. Due to the problem of communication, the visitor took it as “Swiss Wings”. So the name of Swiss Wings in Chinese (瑞士雞翼) has been used and circulated around since then. 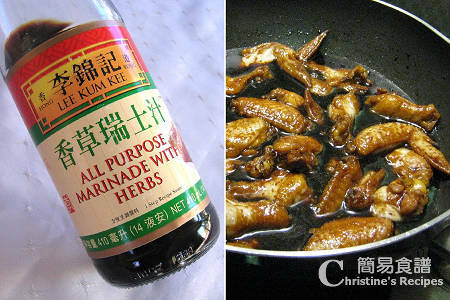 This time I used the popular ready-made sauce by Lee Kum Kee and cooked some wings on the go. Not for long, all of them were gone as expected. Cut chicken wings into sections. Rinse and drain well. Add ginger, spring onion in boiling water. Blanch chicken wings to remove blood. Drain out and immediately put wings into cold water for 10 minutes until they cool thoroughly. The step would make the chicken skin become smooth and silky. Use a large saucepan. Pour in marinade and water. Bring it to a boil. Add chicken wings. The sauce should cover all the wings. When the sauce begins to boil again, slower heat and simmer for 8 to 10 minutes, until the sauce is thicker and the wings are cooked through. Done. Serve hot. In this recipe, the proportion of marinade and water is 1:1. It suits my family’s taste perfectly. But you can change it to 2:1 or adjust the amount of marinade to suit your taste. The basic idea is to get the sauce a bit more salty than you would like your chicken wings tasted. The flavour of marinade would penetrate through the chicken meat through the process of simmering, then your wings would be just cooked perfectly to your taste. I do this quite often as well. And never stop at one! I need a tray of these. They were gone! Reserve one plate for you next time, LOL! Great recipe, Christine! Love your website. Do you use a lot of Lee Kum Kee bottles in your kitchen? I may have to hold off making these, I can see my hubby fast developing a craving where every other meal consists of a batch. Probably not a bad thing though. I also use Lee Kum Kee brand for all my seasonings but haven't seen this one in the supermarket. Your chicken wings must taste heaven as the responses from your family members are so overwhelming. I have used the same marinade!! We can buy this in our large Asian supermarket in Brussels! The dish looks great!! Yum Yum Yum,.. I have to look out for this marinade. Looks soooo good! your braised chicken wing make me drooling!! it's this LKK sauce taste like "loh sui kai" sauce? I'm originally from HK but moved here at a young age and really miss all those foods my mum used to make! (and she never taught me how to cook! )Now I can replicate them using your recipes for my kids too! I've tried your steamed egg dessert and its its brought back alot of memories! I will be trying your beef with black pepper tonight and your sweet soy chicken wings too! Thanks again - am very grateful! Many thanks for letting me know how you liked my recipes. Both of us come from the same country, sharing the same interest and taste of our homeland. What a blessing to share the joy ! Happy cooking to you ! It's very simple to cook... Yummmiii party food !! It's simple and easy to cook... Yummmiiii party food ! !